The US streaming giant Netflix reported earnings for Q4 2018. The company spent heavily on building new streaming content assets, while it kept subscribers glued to their screens throughout the year. The analysis below is a review of Netflix’s year-end quarter and key takeaways. Revenue: Netflix’s total Q4 2018 revenue (domestic and international) climbed to $4.1 billion, marginally missing the $4.2 billion industry expectation. This led to a 4% drop in its stock price reflecting investors’ disappointment over the revenue miss, although the stock price recovered later. On a YoY basis, Netflix revenues grew 35% YoY in FY18 and the growth was well spread-out periodically as well as geographically. Netflix also moved up the app download charts, particularly in the US, within the iOS ecosystem. 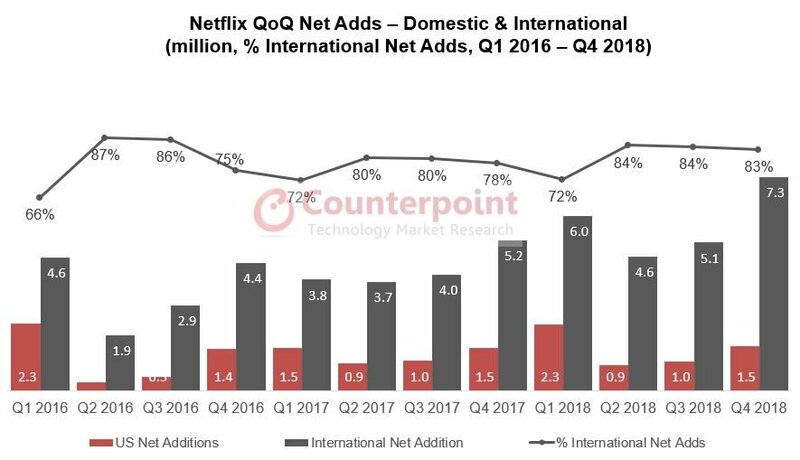 The chart below clearly underlines the growing importance of international markets for Netflix. New Subscribers: When it comes to new subscriber additions, there are multiple positive indicators. In fact, the net addition numbers crossed the management’s own expectations (7.5 million) with 8.8 million new subscriptions in 2018. This continues to come from international markets outside the US. During the last three years, more than one-fourth of the total new additions have come from international markets. New original content has played a key role in international new additions. Birdbox, Bodyguard and You were primary drivers of growth in Q4 2018, globally. 80 million+ households watched Birdbox. Netflix has been quite open about sharing numbers lately, be it on social media or in its recent earnings report. On the local language content side, shows like Elite did very well in Spain as well as with Spanish-language audiences globally. Pricing: Netflix recently revised the subscription cost of its plans in the US. The overall price increase for different plans ranged between 13-18%. This is expected to generate incremental revenue of $1 billion+ in 2019. Commenting on the price increase during the earnings call, Chief Product Officer Greg Peters said, “Management is confident the price hike will not have a chilling effect on new and existing subscribers.” He further added that the company uses overall engagement levels as the key underlining factor that drives the decision making on subscription cost. US Market Saturation: The US is Netflix’s largest and most highly penetrated market. Therefore, YoY net adds are expected to remain low due to higher penetration. 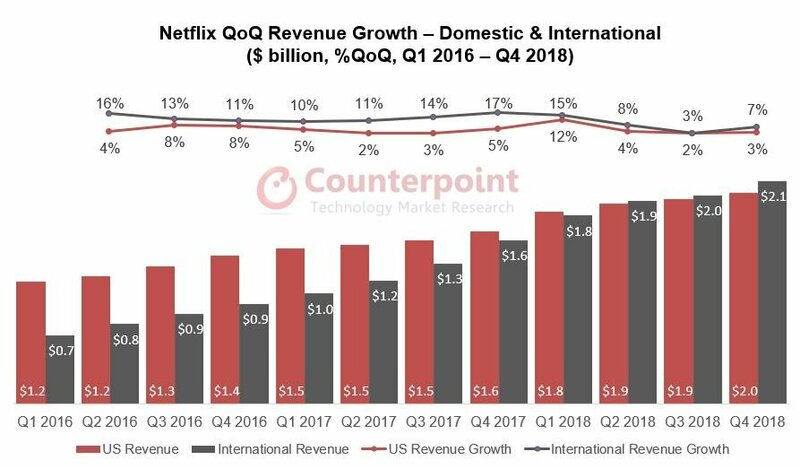 However, Netflix is working on multiple strategies to keep the margins growing even with low new adds and a price increase is one of the ways to drive bottom-line growth, particularly in the US. 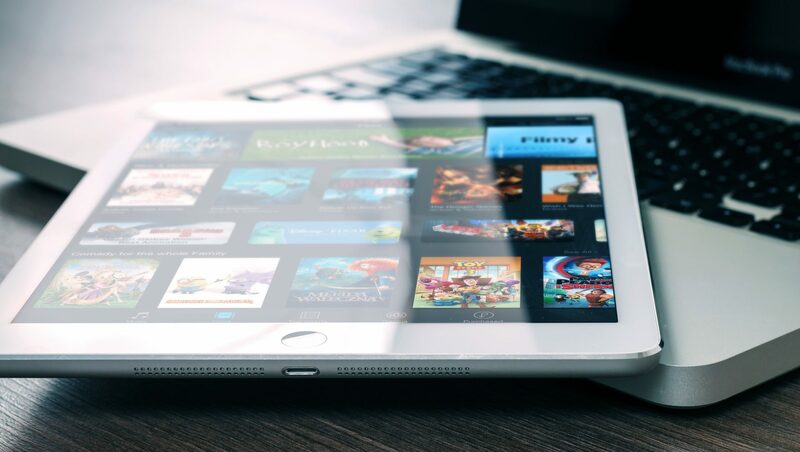 Overall, Netflix believes that the US Internet television market size has the potential to reach 90 million homes, so there is still room for growth in the US. Burning Cash: Negative cashflows remain a key concern for investors. In the fourth quarter, Netflix logged a deficit of $1.32 billion and $3 billion for the whole of 2018. Netflix started investing in original content in 2014, and its content budget has ballooned from $3 billion in 2014 to $8 billion in 2018, along with rising debt (long and short term combined) which now stands at $18.4 billion. Further, the problem is expected to peak in 2019, as Netflix increases its content spends to put pressure on new entrants such as Amazon, Disney+ and AT&T. Rising FX Exposure: Netflix’s foreign exchange risks are likely to grow as the company expands its geographic footprint. 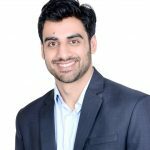 At present, the company is using hedging derivatives and natural hedging in which international market spends are paid in local currency, in case it is favorable. Local Content as a Hook for Global Content: Netflix wants to push its global content, as local content represents a minority audience. However, Netflix continues to invest in local content to onboard new subscribers and get them hooked to their global catalog. Speculations for Lower Pricing in Emerging Markets: So far, Netflix has done well even as a premium service across emerging markets, including India and Latin America. It has been successful in gaining new subscribers with a focus on intriguing original content, quality streaming experience, payment channels, and a polished user interface to drive traction on its platform. Therefore, the probability of lower pricing for emerging markets remains low in 2019.